“Don’t get sucked into the short-term earnings-expectation game – it only tempts you to forgo value-creating investments to report rosy earnings now.” – No cost cutting to reach earnings benchmarks! Reported figures approximate neither a company’s value nor its change over the reporting period. Organizations compromise value to boost short-term earnings. Evaluate which strategy is likely to create the greatest value. M&A (Mergers & Acquisitions) based on expected value, not on immediate EPS (Earnings Per Share) impact. Major acquisitions can create or destroy value faster than any other corporate activity. If management is uncertain whether the deal will generate synergies, it can hedge its bets by offering stock > reduce potential losses for the acquiring company’s shareholders by diluting their ownership interest in the postmerger company. Adoption of a value-conscious business model – focus on high value-added activities and outsourcing low value-added activities. Value-oriented companies regularly monitor whether there are buyers willing to pay a meaningful premium over the estimated cash flow value to the company for its business units, brands, real estate, and other detachable assets. Avoid ill-advised, overpriced acquisitions and let the shareholder decide, whether he or she wants to invest. Repurchase shares if company’s stock is trading below best estimate of value & no better ROI. “When a company’s shares are expensive and there’s no good long-term value to be had from investing in the business, paying dividends is probably the best option“. Adopting either a discounted indexed-option plan or a discounted equity risk option (DERO) plan. Indexed options reward executives only if the company’s shares outperform the index of the company’s peers – not simply because the market is rising. Extending vesting periods and requiring executives to hang on to a meaningful fraction of the equity stakes they obtain from exercising their options. Develop metrics such as Shareholder Value Added (SVA). Reward based on future operating cash flows driven by sales growth and operating margins. Focus on three to five leading indicators and capture an important part of their long-term value-creation potential. Adopt stock ownership guidelines for senior management. Usually expressed as a multiple of base salary > converted to a specified number of shares. Without equity-based incentives, executives may become excessively risk averse to avoid failure and possible dismissal. Public Financial Statements should include a Corporate Performance Statement. Cash flows and accruals for estimating Cash flow prospects. Classify accruals into medium and high uncertainty. Most likely, optimistic, and pessimistic. Rappaport, A. 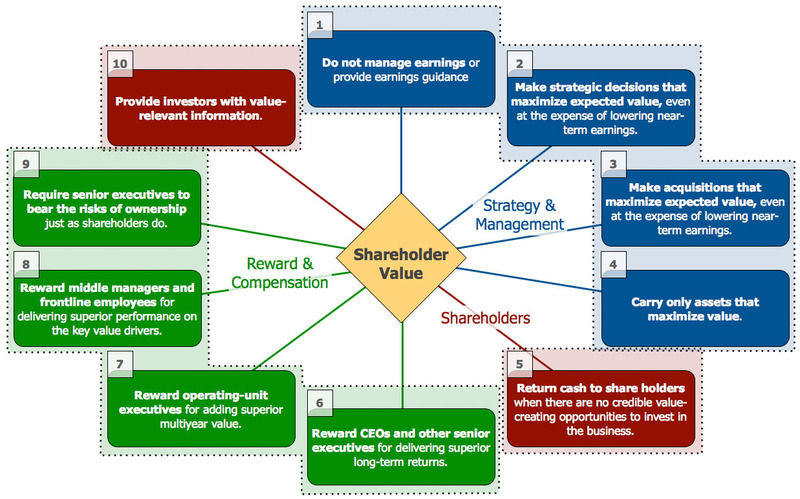 (2006): Ten Ways to Create Shareholder Value. Harvard Business Review.